Join the discussion on our forums! Come discuss Tar Creeper over in our dedicated Tar Creeper discussion topic. 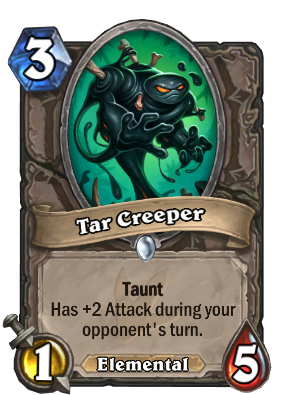 What makes Tar Creeper so good is the fact that it's a taunt so you have to remove it, and for being 3 cost it's a 3|5 body for the opponent. Not necessarily a strong threat, but it's a taunt. Literally the perfect minion to play against aggro, or even control, because removal such as Shadow Word: Pain might not even be used for it due to its low inherent threat level. Did they forget about Am'gam Rager? One of my favorite cards from the set. Good in arena and in constructed. I don't understand: how this can be not meta-defining? What if it was a 3/5 with -2 attack during your turn? It would gain value if silenced at least. are you sure you want to buff this card? Ran across what seems to be a bug with this fella because I wanted to see how The Caverns Below would work with him. Sadly, the +2 attack doesn't happen after activating Crystal Core, however it DOES happen with Small-Time Buccaneer, who has a similar description. My God is this most common card or what? Just finished arena run in every single game on turn my opponents had this card. It's ridicolous. And it's such a strong card. It doesn't matter if you had a strong turn 1 & 2, this card will easily counter it. This card is really, REALLY annoying, even from a non-aggro perspective, and everyone seems to be playing it. How this will work with shadow madness? You steal it and it becomes a 1/5. This is straight up PIRATE WEAPON WARRIOR MURDER! Finally, a replacement for Reno Jackson! Truly excellent, Taz'Dingo on 3 is great, and decks that run this don't care about attack value on their turn early on. An efficient anti-aggro creature that isn't immediately turned around by aggro decks for their own perverse desires. A+, anticipate running 2 in most of my decks until agro goes away. Maybe Tar Rager will be 3 mana 5/1 +2 health during enemy turn?